This story was updated at 3:36 p.m. EDT. 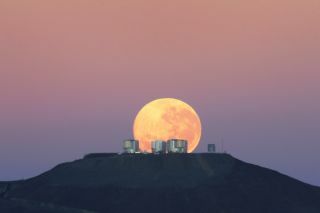 The huge full moon setting in the high Chilean desertdominates a spectacular new photo caught in Chile just as astronomers closed uptheir observatory after a long, busy night. The photo, released Monday, shows a dazzling full moon asit sets behind the Very Large Telescope (VLT) in Chile's Atacama Desert while dawn approaches, coloring the sky with deep hues of blue and purple. Themoon was last full on May 27 and appears larger than normal in the photograph,but it is actually an optical illusion. The large size of the full moon is known as "themoon illusion." It is caused by our mind's attempt to make sense of themoon in relation to earthly objects on the horizon. In the photo, the moon appears to sit on a plateau just behind the VLT observatory. In reality, it is about 30,000 timesfarther away, ESO officials said. ESO staff member Gordon Gillet caught this view of themoon illusion from a distance of about 8.6 miles (14 km) from the VLTobservatory using a 500-mm telephoto lens. He snapped the photo from the nearby peak of Cerro Amazones, the future home of theenormous 137-foot (42-meter) European Extremely Large Telescope (E-ELT), whichwould be the world'slargest telescope when complete in 2018. Amateur skywathers can see the moon illusion too without a camera to prove that the full moon on the horizon ? either duringmoonrise or moonset ? is no larger than the moon at any other time or location.To try it, hold a small object, such as apencil eraser, at arm's length and compare its size to that of the risingmoon. Then go back out a couple hours later, when the moon is higher and seemssmaller, and make the same comparison.